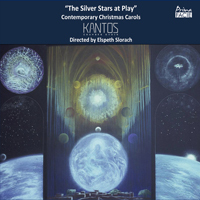 'The Silver Stars at Play' (PFCD075) is a collection of contemporary Christmas carols on CD, sung by Kantos Chamber Choir and directed by Elspeth Slorach. All the carols are world première recordings, and the disc includes carols by John McCabe, Sir Peter Maxwell Davies, Sadie Harrison, Cheryl Frances-Hoad, Douglas Steele and Colin Hand amongst others. Several of the carols have illustrious connections. Child of the Manger (2011) by Sir Peter Maxwell Davies was composed for the choir of the Chapel Royal and was dedicated to Her Majesty the Queen and His Royal Highness The Duke of Edinburgh. John McCabe’s Peace Carol (2006) was first sung by the Choir of St John’s College Cambridge under the direction of Andrew Nethsingha in May 2014, a performance which was among the last of any of his works at which he was present. Except for two carols by Douglas Steele (1910-99) and one by Colin Hand (1929- 2015), all the other carols on the CD are by living composers, nearly all composed since 2000. Some of the texts for these carols reflect the unsettled times in which we live. This became especially relevant to all involved in the CD when, in May 2017 as plans were forming for recording at St Ann’s Church in Manchester, the bomb attack at the Manchester Arena shocked and horrified us all. St Ann’s Square, on the south side of which St Ann’s Church stands, became a focus for remembrance of and tributes to the victims. The words of John McCabe’s Peace Carol, which he and his wife Monica had adapted from Psalm 122 in the Scottish metrical Psalter, took on an immediate and poignant meaning. The all-embracing message of Christmas is, however, present in each and every carol. It is this that provides the timeless quality inherent in the music of Christmas. The carols by Douglas Steele and Colin Hand are accompanied on the piano by Simon Passmore, a full-time staff accompanist and organ tutor at Chetham’s School of Music. Kantos Chamber Choir was founded in 2015 by Elspeth Slorach. The choir comprises the top choral singers across the North West who have begun or are about to begin their professional careers. The choir prides itself on the originality of its concerts, performing both well-known and new compositions in innovative and exciting ways. In addition to their own concerts, Kantos regularly performs for the BBC Radio 4’s Daily Service and Sunday Worship programmes. Elspeth Slorach is a young conductor based in the North West. In addition to directing Kantos, she is the Musical Director of Hallam Choral Society and Preston Orpheus Choir, Director of Music at St Peter’s Church in Hale, and Assistant Conductor for the Hallé’s Youth Choirs. In September 2016 Elspeth began a Master of Performance in Conducting at the Royal Northern College of Music, where she is Assistant Conductor for their Chamber Choir and Symphony Chorus. Prima Facie is the meeting of two minds - Giles Easterbrook and Stephen Plews - both known in the music industry as champions of new music. They have produced or promoted hundreds of projects, many of which have won awards or been recognised as outstanding contributions to the arts.